The enteric nervous system is embedded in the lining of the gastrointestinal system. The enteric nervous system (ENS) is that part of the peripheral nervous system of vertebrates that plays a fundamental role in control of the gastrointestinal system. It is responsible for the behavior of the bowel, as well as regulatinginterstinal blood supply and other digestive functions. The enteric nervous system is very complex and has many more neurons than the spinal cord. This system is capable of autonomous functions, acting independent of conscious control, such as the coordination of reflexes. It also receives considerable innervation from the autonomic nervous system. Thus, it generally is considered a part of the autonomic nervous system, which is one of the two main divisions of the peripheral nervous system. Similarities between the enteric nervous system and the central nervous system has led to the the ENS being referred to as the "second brain." It works harmoniously with the various organs of the digestive system, and in cooperation with the rest of the nervous system, to allow proper digestive function. However, there are a number of disorders that can affect the enteric nervous system and some evidence for age-associated changes in innervation contributing to increasing disorders in the elderly. The study of the enteric nervous system is known as neurogastroenterology. The enteric nervous system is immensely complex and until recent years has been largely neglected. It has as many as one billion neurons, which is one hundredth of the number of neurons in the brain, and considerably more than the number of neurons in the spinal cord (Hopley and van Schalkwyk 2006). The enteric nervous system is embedded in the lining of the gastrointestinal system, including innervating areas around the intestines, pancreas, and gall bladder. It commonly is considered as part of the autonomic nervous system, which is that part of the peripheral nervous system that largely acts independent of conscious control (involuntarily). The other subdivisions of the autonomic nervous system are the sympathetic nervous system and the parasympathetic nervous system. The peripheral nervous system is that part of the vertebrate nervous system outside of the brain and spinal cord. The complex behaviors of the bowel are regulated by the enteric nervous system, including propulsive peristalitic movement and various movements that result in mixing. Intestinal blood supply and mucosal epithelial water and electrolyte transport are also regulated by the enteric nervous system. The enteric nervous system may also be involved in a complex interplay with the immune system (Hopley and van Schalkwyk 2006). Two of the major structural components of the myenteric plexus (of Auerobach) and the submucosal plexus (of Meissner). The neurons of the enteric nervous system are collected into these two types of ganglia (tissue mass). Myenteric plexus. The myenteric plexus or Auerbach's plexus is large, found throughout the gastrointestinal tract, and lies between the longitudinal and circular layers of muscularis externa. It provides motor innervation to both layers and secretomotor innervation to the mucosa, having both parasympathetic and sympathetic input. The myenteric plexus arises from cells in the Nucleus ala cinerea, the parasympathetic nucleus of origin for the tenth cranial nerve (Vagus), located in the medulla oblongata. The fibers are carried by both the anterior and posterior vagal nerves. It is found in the muscles of the esophagus, stomach, and intestine (eMedicine 2003). Submucosal plexus. The submucosal plexus is smaller than the myenteric plexus, and unlike the myenteric plexus only have parasympathetic fibers. This plexus lies in the submucous coat of the intestine; it also contains ganglia from which nerve fibers pass to the muscularis mucosae and to the mucous membrane. 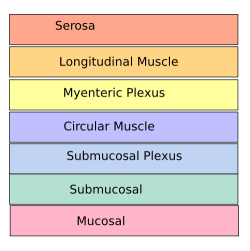 (The submucosa is the layer of dense irregular connective tissue that supports the mucosa, as well as joins the mucosa to the bulk of underlying smooth muscle, fibers running circularly within layer of longitudinal muscle.) 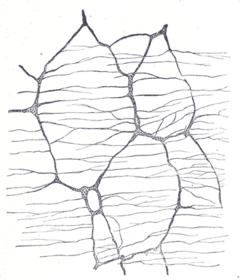 The nerve bundles of the submucous plexus are finer than those of the myenteric plexus. The esophogus and stomach lack a submucosal plexus (Hopley and van Schalkwyk 2006). The motor fibers from the submucosal plexus stimulate secretion in the epithelial crypt cells (Hopley and van Schalkwyk 2006). 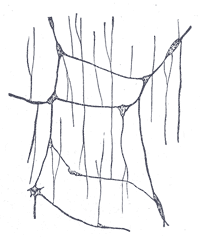 There are a wide variety of connecting fibers that link the enteric nervous system with the rest of the nervous system, including vagal connections that provide a sensory link for physiological information and sympathetic unmyelinated C fibers for sensations of visceral pain (Hopley and van Schalkwyk 2006). Serotonin is one of the main neurotransmitters in the enteric nervous systems (Hopley and van Schalkwyk 2006). There are several reasons why the enteric nervous system is surprising similar to the central nervous system and may be regarded as a "second brain." The enteric nervous system can operate autonomously. It normally communicates with the central nervous system through the parasympathetic (for example, via the vagus nerve) and sympathetic (such as, via the prevertebral ganglia) nervous systems. However, vertebrate studies show that when the vagus nerve is severed, the enteric nervous system continues to function. The complexity of the enteric nervous system is another reason for its status as a second brain. In vertebrates, the enteric nervous system includes efferent neurons, afferent neurons, and interneurons, all of which make the enteric nervous system capable of carrying reflexes in the absence of CNS input. The sensory neurons report on mechanical and chemical conditions. Through intestinal muscles, the motor neurons control peristalsis and churning of intestinal contents. Other neurons control the secretion of enzymes. The enteric nervous system also makes use of the same neurotransmitters as the CNS, such as acetylcholine, dopamine, and serotonin. The enteric nervous system has the capacity to alter its response depending on such factors as bulk and nutrient composition. Many diseases can alter function in the enteric nervous systems. Among the most important are diabetic autonomic neuropathy (which results in gastroparesis, or autovagotomy, as well as colonic movement disorders, such as nocturnal diarrhea); infectious diarrhea; and schleroderma(a chronic autoimmune disease characterized by a hardening or sclerosis). Central nervous system diseases such as Parkinson's and Alzheimers disease also affect the bowel. Among many other disorders that can have dysfunction of the enteric nervous system as a component are amyloidosis, prophyria, Chagras disease, mitrochondrial cytopathies, post-infectiouis irritable blowel syndrome, and domoic acid (seafood) poisoning (Hopley and van Schalkwyk 2006). A patient with Parkinson's disease frequently shows lewy bodies in the patient's bowels, and a patient with Alzheimer's disease frequently shows in his or her bowels the amyloid plaques together with neuorfibrillary tangles characteristic of that disorder. This offers the possibility that a bowel biopsy will be able to diagnosis Alzheimer's disease in the future. Glial cells damage is seen in necrotizing enterocolitis and Crohn's disease (Hopley and van Schalkwyk 2006). There is evidence that selective neurodegeneration may occur in the ageing enteric nervous system and that age-associated changes in intestinal innervation may be a factor in the gastrointestinal disorders that increase in frequency in the elderly, such as constipation, dysphagia, and gastrointestinal reflux (Saffrey 2004). eMedicine. 2003. http://www.emedicine.com/asp/dictionary.asp?keyword=myenteric+plexus Myenteric plexus. eMedicine. From Stedman's Medical Dictionary, 27th edition. Lippincott Williams & Wilkins. Furness, J. B. 2006. The Enteric Nervous System. Malden, MA: Blackwell Pub. ISBN 1405133767. Furness, J. B. 2000. Types of neurons in the enteric nervous system. Journal of the Autonomic Nervous System 81(1-3): 1-3. Gershon, M. D. 1998. The Second Brain: The Scientific Basis of Gut Instinct and a Groundbreaking New Understanding of Nervous Disorders of the Stomach and Intestine. New York, NY: HarperCollinsPublishers. ISBN 0060182520. Goyal, R. K., and I. Hirano. 1996. The enteric nervous system. New England Journal of Medicine 334 (17): 1106-15. Grundy, D., and M. Schemann. 2006. Enteric nervous system. Curr Opin Gastroenterol 22(2): 102–10. PMID 16462164. Hopley, L., and J. van Schalkwyk. 2006. The enteric nervous system (ENS). Anaethetist.com. Retrieved November 6, 2008. Kunze, W. A., and J. B. Furness. 1999. The enteric nervous system and regulation of intestinal motility. Annual Review of Physiology 61: 117-42. Saffrey, M. 2004. Ageing of the enteric nervous system. Mech Ageing Dev 125(12): 899–906. PMID 15563936. History of "Enteric nervous system"
This page was last modified on 21 November 2008, at 16:00.